Graves Motorsports Aprilia RSV4 Cat Eliminator Exhaust System for the 2016 model RSV4 RF / RR (Titanium tubing / Titanium Sleeve / Carbon End Cap). This Graves Aprilia cat eliminator motorcycle exhaust is handcrafted in the USA. The Graves Motorsports Aprilia RSV4 exhaust dramatically improves looks, increases horsepower and reduces over 10 pounds from the RSV4's weight. This Graves Motorsports Cat Eliminator exhaust is designed for the racer on a budget seeking the closest performance exhaust to a full race system. We did not allow compromises in the development of this system. Material diameters, lengths, the silencer core size and length are optimized for maximum power output throughout the throttle and RPM range. 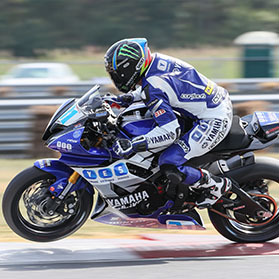 We use the same 1.00 MM thick wall high heat grade Titanium tubing used on our Superbikes. This material is designed special for maximum durability and oxidation resistance up to 800*Celsius / 1472*Fahrenheit. It is designed to live at almost twice the temperature of normal Grade2 Titanium. The tubes are precision bent and cut with the latest equipment available. The tubing is then welded in fixtures designed so that repeat-ability is second to none. The silencer is one piece with the tail pipe welded to the deep draw tapered Titanium entrance cap. The silencer is hung with a strapless an Aluminum bracket / anodized black and built into the silencer. The silencer sleeve is made of Titanium that attaches to the titanium end caps with stainless aircraft grade rivets and Titanium silencer bands. The inter core tube is made of stainless that slips over the entrance and into the exit cap that is a stamped from Titanium and welded to a 60* slash cut Titanium tube covered with a Carbon Fiber beauty cover. This system performs like our superbike pipe and shows like jewelry. Stock weight = 13.5 lbs. Ordering this product was a breeze and thank you for the free shipping. The pipe looks and sounds like a Superbike but not too loud.